Venture out of the ordinary and try a unique style of dining, with Rodizio Grill’s authentic Brazilian cuisine. 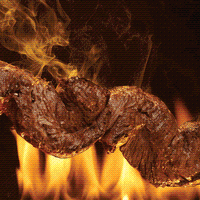 Our perfectly seasoned rotisserie grilled meats are served to you table-side by Rodizio’s Gauchos. Rodizio Grill’s atmosphere and fare brings the warmth and spirit of Southern Brazil to Sarasota. Inspired by the Southern part of Brazil, Rodizio Grill offers over a dozen rotisserie-grilled meats, perfectly seasoned and carved tableside by Rodizio Gauchos. Our meats are sliced thin to capture the tenderness and flavor produced by our slow-roasting process. Pile your plate high with over 30 award-winning salads made fresh from scratch daily. Our gourmet salad bar includes a variety of signature salads, fresh fruits and vegetables, countless cheeses and cured meats and much more. Complement our delectable meats with freshly made side dishes included with your meal. 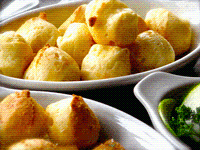 Enjoy made-from-scratch Pão de Queijo, Brazilian favorite Feijoada, Farofa, Bananas Fritas and much more. Your taste buds are bound to be satisfied. Get a taste of Brazil's sweet side with desserts homemade daily in each of our locations. Our recipes have traveled from Brazil and are passed down from generation to generation in the family of our founder, Ivan Utrera. Sip your way through São Paulo with our Brazilian inspired drinks. The Caipirinha, a Brazilian tradition, is our signature drink made with fresh limes and Cachaça. We also offer a variety of fresh juices, local beer and wine for everyone to enjoy. From Bradenton: 64 E to I-75 S to exit 210 (Fruitville Rd). From Sarasota: Fruitville Rd (780) off N. Cattlemen rd.From Venice: I-I-75 N to exit 210.